1963 Zippo for USAF Southern Command logo on front, "To: Corl. FAP Carlos Soto Vera Jefe de Fuerzas Aereas Tacticas Combinado Operacion Ayacucho 6-9 Diciembre 1964"
1959 Zippo engraved with a USA Statue of Liberty Emblem and "Lima, Peru 1959"
1960 Zippo advertising Marcona Mining Company. The US company was named after an area where a large iron mine, the Marcona mine, located near the coastal town of San Juan de Marcona in western Peru. 1950's Unmarked Sterling lighter with the letters "JBH" and an attached emblem of the United States on the front. The reverse reads "Talara Peru" and has an emblem of the US Army Quartermaster Corps on the reverse. The top has an army officer serial number engraved. 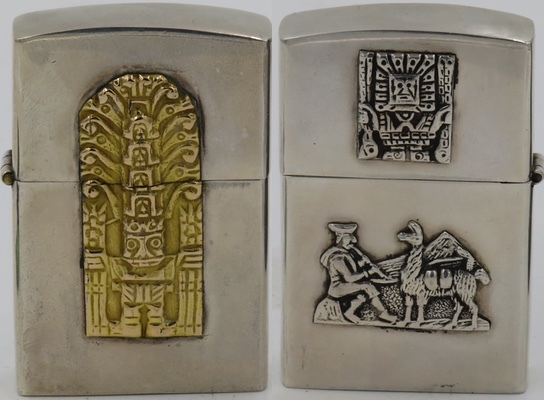 925 Sterling Silver lighter with ornate designs by the Peruvian artist Graziella Laffi (1923–2009).